Recently I learned of the passing of these two lovely souls. 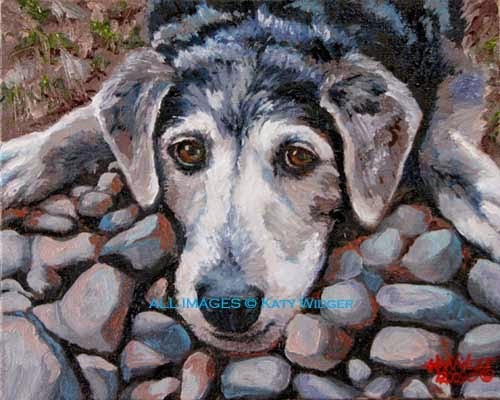 This is what I wrote about Mati back in 2009 when I first painted her portrait: "Don't let the grey muzzle fool you, this girl is still very much young at heart. You can see her playful spirit in her eyes, in her countenance and posture. Mati, short for Matilda, is named for the character in the Roald Dahl short story. She was the one left out, from whom not much was expected. That sort of explains Mati's start in life, as well. She was the little shy one, last of her litter, the unchosen. But someone wanted her, very much. And saw the potential in those beautiful eyes. She's now ten years into her life with her special people, who very much love and adore this young lady." Max was father to our Hunter, and his death from cancer is sad and tragic, a reflection of the illnesses caused by our modern life that we share with our dogs. But Max, too, had a grand life on a large ranch, running free, pursuing dog interests to his heart's content, expressing all the "dogness" he possessed. Couldn't ask for more! Here's some of what I wrote about Max back in 2010 after I finished his portrait: "His call name is "Max". 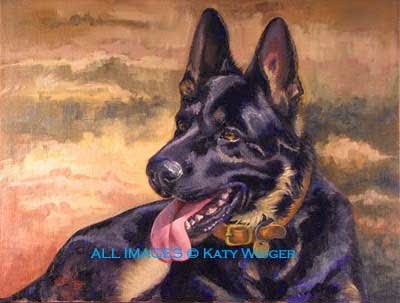 His immediate ancestors hail from Germany, where the German Shepherd Dog originated and is still bred best. He lives on a ranch in the stunning southwestern region of NM, near the town of Magdalena, just west of Socorro. His kingdom consists of vast acreage to oversee, beautiful vistas to admire, and a pack of seven, including sons and daughters from his mate, Catey. He is Hunter's father, and it's quite obvious that my wonderful young "acorn" didn't fall far from this strong and magnificent 'tree.' "
I was privileged to meet both of these dogs in person, and I offer now my condolences to their people, who loved them and now mourn their passing. It's hard to lose a dog you love, sometimes harder than losing people we care about. I've been there before myself, and I know the heart ache that can last for months, and even years. After I lost Mychal, too soon, too tragically, I spent three years in deep mourning, yearning for reassurance that he lived on in Spirit. As a Christian I found that assurance in God's Word. Particularly, in several books written by Christians who had experienced the same loss, had the same question, and turned to the Creator for answers. "Do Dogs Go To Heaven?" by M. Jean Holmes (available on Amazon) is one book among many that I highly recommend for anyone needing assurance that animals, all living beings, do indeed posses a spirit and a soul, and that spirit returns upon death to the God who created it. Our beloved dogs and pets, indeed all animals, do go to heaven! Are you going to meet them there? I hope so! Jesus Christ is the Way, the Truth and the Life.